BALLOONS OUTSIDE MY WINDSHIELD, TOO! The Albuquerque International Balloon Fiesta is celebrating its fortieth year this week. We took out of town guests to see the fanfare at a Balloon Glow. It is always a treat. Not a picture you can snap just anywhere. Wow, this museum would be fun to visit for two reasons. Art and windows, what a great combination. The Dali Museum, in St Petersburg, Florida, not only offers amazing displays of art by Salvador Dali spanning over a 50 year period, it provides us with some pretty incredible window design. On January 11,2011 at 11:11 am this beautiful structure opened. I have to give them a thumbs up for making sure they keep the windows clean. Here is a local window cleaning company, Bay Area Window Cleaning, making them sparkle. This is a $36 million museum … I wonder how much the window cleaning budget is. Hopefully, I am not speaking prematurely. Along with a little monsoon moisture arriving this past weekend – we are way behind this year in New Mexico – I am happy to report that the hummingbirds might be around after all. All my feeders are clean and re-filled after witnessing 3 or 4 friends in one day, and one was a tiny little critter. Maybe they will finally appear in numbers like they do most years. I sure hope so, cause I love those hummers. Only indirectly changing the subject, my title fits me being delayed with my blogging responsibilities. I don’t know where the time goes. I want to make sure I highlight some more businesses, especially those window cleaners. I love window cleaners, I’ve been married to one for almost 34 years. However, I think he lost his squeegee a while back . Thank goodness for younger family members who picked up the trade. Let’s travel to Maryland. Somewhere between Washington DC and Baltimore – please excuse my lack of geographical expertise – there is a well-established business called JENCOR Services. Owned by Dwight Rowe, they cannot wait to live up to their motto which is “Making Them Shine One at a Time.” Check out their website to fully get how professional they are, and to check out all their services, and the areas they serve. I am still wondering who cleans the White House windows. This one is close, but I am pretty sure those windows are done in-house. Now that the hummers are back, I think I need my windows cleaned. And, I don’t mean I am feeling pressured or the sun is hot today. I mean my heat is on! I have not had the heat on in our house for almost a month, and today, May 1st, I broke down and turned it on. It is like winter has to make one more statement before getting the heck out of here. The winds are hitting over 40 mph, the high temperature today might reach 48 – this coming Thursday the temperature is suppose to get to 85. The hummingbirds are trying to visit the feeders outside my windows, but they are finding it quite challenging, to say the least. Visualize a nice warm day. Let’s visit Orlando, Florida. Their high today today will be 88, and we could go to Disney World. Millions of visitors head that way every year to visit all the attractions. Over two million people live in Orlando. That also means lots of windows. If your windows reside in Orlando, check out hiring a professional. Absolute Window Cleaning not only cleans windows and screens, they do pressure washing,blind and shutter cleaning, gutter cleaning and screen replacement. Have a business? They accommodate commercial too. To avoid getting blown away, I think I will stay inside today, clean my kitchen and maybe finish the book I am reading. Nothing like sitting in The Parlour Car on Amtrak’s Coast Starlight to make one appreciate the fact that windows can be made to fit. What a way to see the Pacific coast. There are definitely a lot of naked windows on the train to look out and enjoy the various terrains. We went from the desert in New Mexico to palm trees and beach in California to mountains, snow and tall forests in Oregon. Now I am officially on vacation. But, that won’t stop me from blogging about windows or anything else that seems to be worth mentioning. Being in Portland reminds me of when we started our window cleaning company up here. We were always worried about the rain. What we learned later when we moved to drier climates was that customers make a bigger deal about weather when you have less. If it rains it ruins the day, unnecessarily. In Portland, if you stop what you are doing because it is raining, you might as well stop doing anything. This is it! Now it’s all about looking out the train windows on Amtrak going up the West Coast from LA to Portland. (The leg from Albuquerque to LA is overnight and not as scenic.) The windows will most likely not be totally clean, but the view is amazing. I will be posting some pictures of outside the windows for sure. I am putting the link to my previous story from a year ago called THE LITTLE PURPLE SUITCASE to introduce or remind all my visitors of its inspiration. Mom’s ready to board the train for her final train trip! But, there will be more story. I love the Pacific Northwest even though I do not live there anymore. I am traveling there soon for the first time in over 4 years. That means I will see a whole lot of family and friends, and I get to visit the beautiful Oregon coast too! Looks appealing, don’t you think? I also love highlighting businesses in that area, especially when they clean windows. Not too far from the coast, in Corvallis, is the perfect company to use if you are ready to HIRE A PROFESSIONAL to improve your outlook on life, and of course live in the general vicinity. They are ready to do what ever you need, which is why they are Beckon Call Window Cleaning. I love it when people play with words! I love blogs too, and they just happen to have a pretty darn relevant blog when it comes to windows. I wonder who does the windows at this house. All those little cut up panes can be a real pain for sure. Well, we know we can eliminate the current residents, and I am pretty sure there are a lot of security issues when it comes to hanging out here. In Roosevelt’s presidency, and before, a high ranking military officer was in charge of all the maintenance. I can’t seem to find any data on what happens now though. If any one out there can fill us in, please do! If you live in a not so famous house in the DC area or in Maryland and you need window cleaning, check out We Do Windows. Besides cleaning your windows, they offer power washing, gutter cleaning and other maintenance services. And, they’ve been around since 1981. Experience and longevity are good qualities. If you want to really improve your outlook on life, HIRE A PROFESSIONAL. Looks like I either need to take a trip to Vermont, or find a window cleaner who lives there to get some first hand information on this one. That, my appreciated, blog-visiting friends, is a picture of a “witch window” that is pretty much so exclusive to Vermont it is also known as a “Vermont window.” My dear husband has washed a lot of windows and has never seen one. But, he has never washed a window in Vermont, or for that matter done anything else in Vermont. Why “witch window” you ask? Supposedly witches are unable to fly their broomsticks through a tilted window. 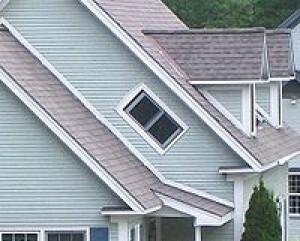 They are also called “coffin windows” for even more far-fetched reasons – something about removing coffins from the second story when the staircase was too narrow. Hmmm – wonder what they do with it once its on the roof? It does not end there! Two names that just make sense, “sideways windows” or lazy windows,” seem most appropriate, even though they certainly do not conjure up as many pictures in my mind. Anyone here ever seen (or cleaned) one of these not so common windows? Well darn. I don’t think this house needs any window treatments from For Your Windows, but I bet a professional window cleaner keeps the glass clean. I have no reason to visit Chattanooga, Tennessee right now; however, if I do in the future I may rent this house just for fun. It is used now as a vacation getaway. The window cleaning guy in my house told me the windows would be easiest to wash with a water-fed pole. If you need some professional window cleaning done in your home, and you live in Chattanooga check out True Shine Window Washers. I wonder if they have ever been beamed up at The Spaceship House. To check out the inside go here for some pictures and information.